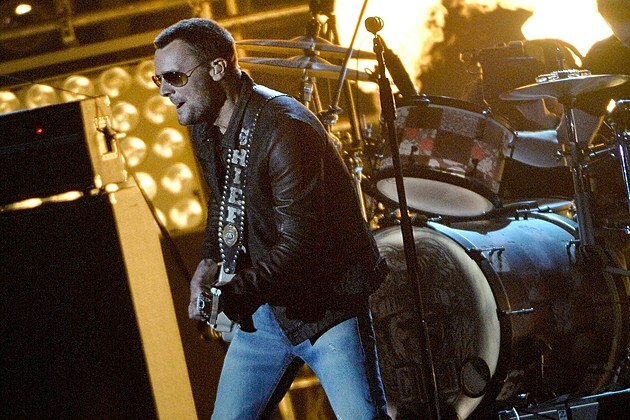 Country singer-songwriter Eric Church's fourth studio album The Outsiders was released in the US on 11th February and in the UK on 24th February. Currently the number one album on the Canadian Albums Billboard Chart, US Billboard 200 and the US Top Country Albums charts, The Outsiders also marks Eric's second number one album. The album is also currently positioned at number two on the UK iTunes country albums chart and is poised to overtake Music Of Nashville: Original Soundtrack Season 1 Volume 2 (Deluxe). I am really not a fan of the album's title track and lead single (and also the opening track). The track starts with an electric guitar hook and spoken lyrics but then after about a minute it seems like all the instruments are thrown in and the contrast between the two sections is stark. Throughout the track the instrumentalisation just seems overpowering and does nothing to make me want to listen to it, in fact I usually find myself skipping the track about halfway through. In contrast to this, the second track on the album, A Man Who Was Gonna Die Young is one of the gems in my opinion. With a similar feel to Like Jesus Does from his previous album, the track is also one of the most stripped back instrumentally on the whole album. With lyrics such as "you wonder how you out-lived Hank and Jesus" and "I put the rage in a river, roll in the thunder, but you kept me from goin' under" the sentiment behind the track is strong and heartfelt. Following directly on from this is Cold One. It has a promising start with a soft acoustic guitar accompaniment to Eric's vocals however the track is then ruined by the strange country hip-hop feel to the instrumentalisation shortly after that and then the frenetic playing at about three quarters through the track. In my opinion it just feels like the track has too much piled into it and just does not work. The lyrical focus on "a cold one" (beer) seems an unfortunate choice from an artist who is also a very good singer songwriter. That's Damn Rock & Roll is similar to this in that it feels overpowering through the majority of the track and has a strange rap section towards the beginning that in my opinion really doesn't work. Talladega is a treat to hear. With probably the strongest 'country' feel, the track's main accompaniment in the verses is a very strong acoustic guitar hook with electric guitar and drums introduced from the chorus. With a feel good, relaxed feel the instrumentalisation on the track fits well with the lyrics - lines such as "we were laughing and living, drinking and wishing" and "most days in life don't stand out , but life's about those days that will". The second (and current single) is also one of my favourites on the album. Give Me Back My Hometown builds well throughout the track and has a great pace to it. The electric and acoustic guitar lines give a strong base to the track which is then slowly built on top of. The strongest instrumental addition in my opinion is the military style drumming which is used cleverly in that it isn't used all the way throughout the track. There is an electric guitar solo in the track however this is one of the instances that it actually contributes to the track in my opinion and doesn't just create extra noise. In my opinion the video is a little strange (you can see it here) but all in all, a very well thought out track. Whilst the album as a whole is a bit of a mixed bag of songs for me you can't help but recognise the risk's that Eric has taken in this album, from the production as a whole to the lyric "The devil walks among us folks and Nashville is his bride." in Devil, Devil (Prelude: Princess of Darkness). Eric's 'outlaw' image continues throughout this album and certainly builds upon what was done so successfully in Chief. I continue to be a fan of the more stripped back side of Eric's releases and I am happy to see that there is a good mix of songs here. Overall this is still a strong album, I think fans have to appreciate that Eric will also have rockier tracks on his albums than many artists would release. Whilst I feel he goes a bit over the top in some instances during the rockier tracks I wouldn't dissuade anyone from listening to them and would certainly point listeners towards the aforementioned "Recommend listening" tracks. Eric is currently over in the UK as part of a short European tour and having seen him twice before I would definitely recommend seeing him live if you are able to. He is a consummate showman but be prepared for a lot of his rockier side! Labels: Eric Church "The Outsiders"